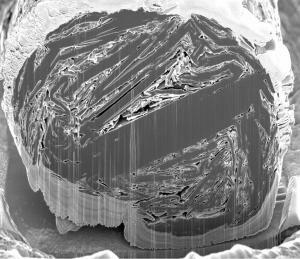 Cross Section view of purified spherical graphite. Edge planes effectively folded. 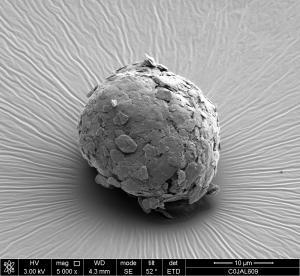 Purified Spherical Graphite made from Battery Minerals Flake Graphite. Made by Urbix Resources. Urbix Resources producing remarkably high-quality spherical graphite particles: yield is over 75 percent, much higher than currently standard in the industry. MESA, ARIZONA, UNITED STATES, October 30, 2018 /EINPresswire.com/ — Some of the world’s most important players in the energy storage industry came together in October at Graphite + Anodes 2018. The two-day event was part of Benchmark Minerals Week at Newport Beach, California. They were gathered to discuss new technologies and global supply chains. One presenter at the event was David Flanagan, Managing Director of Battery Minerals (ASX: BAT) a publicly traded graphite mining development and minerals company dedicated to exploring for and developing graphite mineral deposits in Mozambique. During Flanagan’s talk, he showcased the successes the company has had with the proprietary purification and spheroidization techniques developed and applied by Urbix Resources at the company’s state-of-the-art laboratory in Mesa, Arizona. Flanagan reported that Urbix had recently successfully purified graphite for Battery Minerals with a very good outcome, both for the environmentally friendly techniques that had been used and the purity of the results. The tests were done on graphite sourced from Battery Minerals’ Montepuez Graphite Project in Mozambique and included all flake size fractions to >99.95% total graphitic carbon, then went on to produce remarkably high-quality spherical graphite particles with a yield in excess of 75 percent. This is an exciting outcome because standard spheroidization results in 30 to 40 percent yields. In addition, the high level of spherocity (not potato shaped), ideal D50 particle size distribution, and effective “folding” of the graphite edge planes add up to a very suitable candidate for the lithium-ion battery market. This is expected to result in longer total cycle life for the battery. The unique combination of Urbix’s low-cost purification, Flanagan told those assembled, and high-yield spheroidization results in a very real economic advantage, even over China who dominates more than 90 percent of this portion of the graphite market today. In addition to the work Urbix has produced for Battery Minerals, the company has proven their purification technology on natural graphite materials sourced from every producing continent, potentially comprising one third of the world’s current and future natural graphite production. Already working closely with the US Department of Energy, Urbix is on track to become one of the most prominent providers of li-ion battery grade anode materials in the United States and abroad. Further vetting and supply chain optimization is now underway with Urbix’s global partners. Urbix Resources LLC is one of the premier providers of refined graphite powders, pristine graphene, and specialty graphite products in the world. Urbix is also an expert in li-ion battery cell design and boasts next generation high voltage electrolyte and fast charging electrode nanoarchitecture. The company creates radical change in the way natural graphite is refined and commercialized, and specializes in all aspects of the graphite value chain. It is a premier provider of refined graphite powders, pristine graphene, and specialty graphite products. Urbix’s advanced technology includes environmentally and cost conscious purification methods and significant intellectual property developments in a wide range of applications. Battery Minerals Limited (“Battery Minerals”) is an ASX listed Australian company with two world-class graphite deposits in Mozambique, those being Montepuez and Balama Central. Battery Minerals has produced high quality graphite flake concentrate at multiple laboratories and intends to commence graphite flake concentrate production from its Montepuez graphite project with first shipment, subject to financial close, expected in early 2020 at export rates of 45,000 to 50,000tpa at an average flake concentrate grade exceeding 96% TGC. In December 2017 and January 2018, Battery Minerals signed four binding offtake agreements for up to 41,000tpa of graphite concentrate, representing over 80 percent of Montepuez’s forecast annual production. The Mozambican Government has granted Battery Minerals a mining license for its Montepuez graphite project and accepted the Company’s EIA for the Montepuez graphite project. As Battery Minerals executes subsequent expansions, it expects production to grow to over 100,000 tonnes per annum graphite flake concentrate from its Montepuez graphite project in its second year of operations. In March 2018, Battery Minerals announced the delivery of a scoping study on its Balama Central project, which comprises a Stage 1 production rate of 55,000tpa (B1) and Stage 2 production rate of an additional ~55,000tpa (B2) for an aggregate of 110,000tpa from Balama Central. Balama Central is currently the subject of a feasibility study expected to be completed in November 2018. Combined with Montepuez and subject to continued positive economic, social and technical investigations, Balama Central provides scope for self-funded growth from a ~50,000tpa production-rate in year one to more than 200,000tpa in year five.